Want more proof that people are holding onto their cars longer (and hopefully keeping them in good shape, as well)? Try this statistic on for size: According to Edmunds.com, the average age of a trade-in car has risen from 5.6 years last summer to 8.7 years this summer. If this is true then we should be going in to have our cars checked out and make them last longer. I was reading on the NOLN blog (National Oil and Lube News) shops are starting to embrace new technology... yup... there's a magazine and blog for everything, but actually its interesting and has all the good info for the industry. It was also mentioned in the AOCA talk chat too that shops are trying everything to connect with customers. 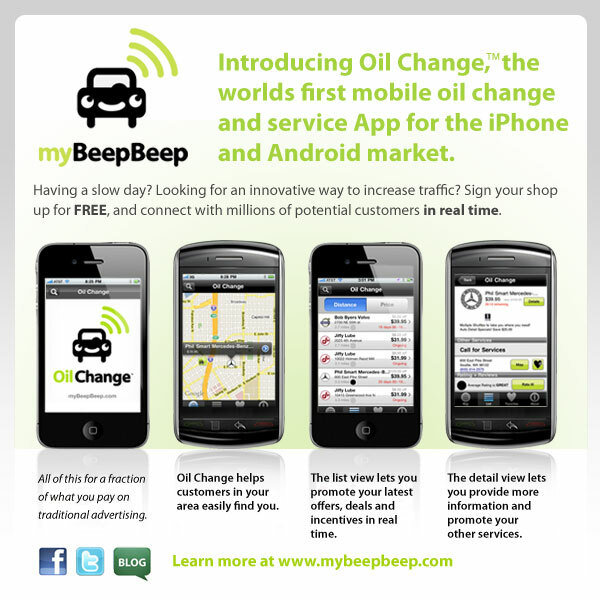 From Facebooking to Twitter to Foursquare to the myBeepBeep Oil Change app on the iPhone, that's right they mentioned mybeepbeep in the same sentence as those giants WOW, that they are offering amazing deals though codes and coupons and instant posting discounts on oil changes, car washes and other services and products like tires with great prices and low price guarantees. That is where it would be nice to challenge the lowest price in one place. Otherwise you spend all day searching and wonder if the lowest price is the best thing for me. What is the shop isn't a good one so to speak or it's too far away. So if your reading this, thanks, now go download the Oil Change app on the itunes store and get your oil change for goodness sake!